For several years in a row, our children came home for Christmas and every Christmas Eve we’d make a batch of home-made pasta. Of course good pasta needs a good sauce, so here’s my recipe. 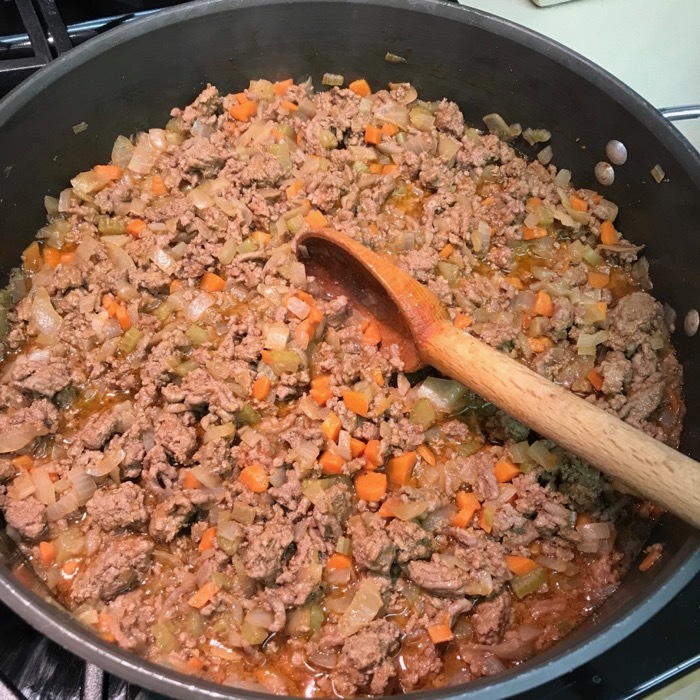 I make this is two parts: one is the “Bolognese” part, made with a carrot, a celery stalk and the leanest ground beef you can find, then simmered slowly. The other part is made from high-quality canned tomatoes, simmered with minced garlic with added basil and olive oil. If you have a vegan, like we did one year, then this second sauce will work for them. 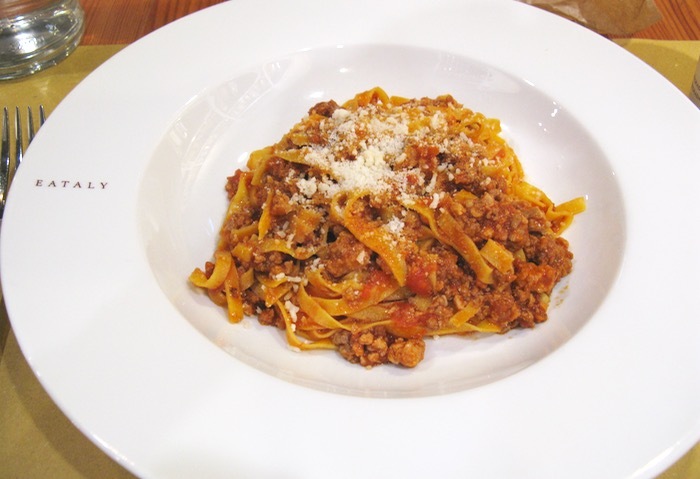 I combine the two sauces as we like our Bolognese sauce to resemble the one we ate in Bologna in 2012, at the Eataly store (shown above with a tagliatelle noodle). This recipe serves about 8-10; half it if desired. Melt the butter in a large flat pan, add olive oil. Add the vegetables and the meat and season with salt and pepper. Mix well and cook over low heat for a few minutes until the vegetables have softened and the meat begins to brown. Dilute the tomato paste with a little bit of water, and add to the pan, stirring well to distribute. Cover and cook over a very low heat for 1-1/2 hours, adding a little water if the sauce appears to be drying out. 2 cans high-quality Italian Peeled Tomatoes. 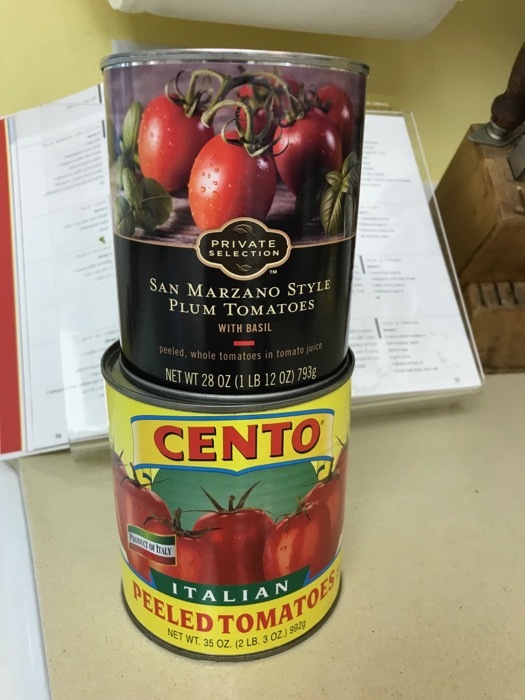 I use both of the above, but Cento is preferred. 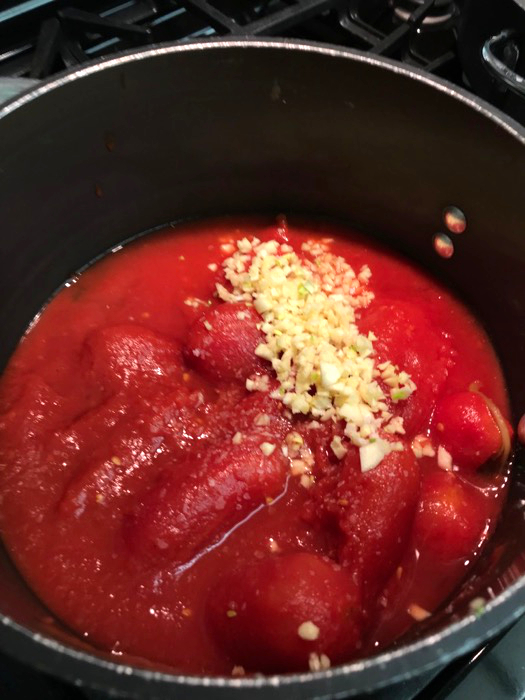 Put the tomatoes with can juice in a pan and add the minced garlic, the sugar and a sprinkling of salt (shown above). Cover and cook over a very low heat for thirty minutes without stirring. Using a potato masher, crush the tomatoes, stir and let cook another fifteen minutes. If you are using only the Tomato Sauce, at the end of cooking, swirl in about 2-3 Tablespoons high quality olive oil and 15 fresh basil leaves, torn. You can omit this if you are proceeding to step III. 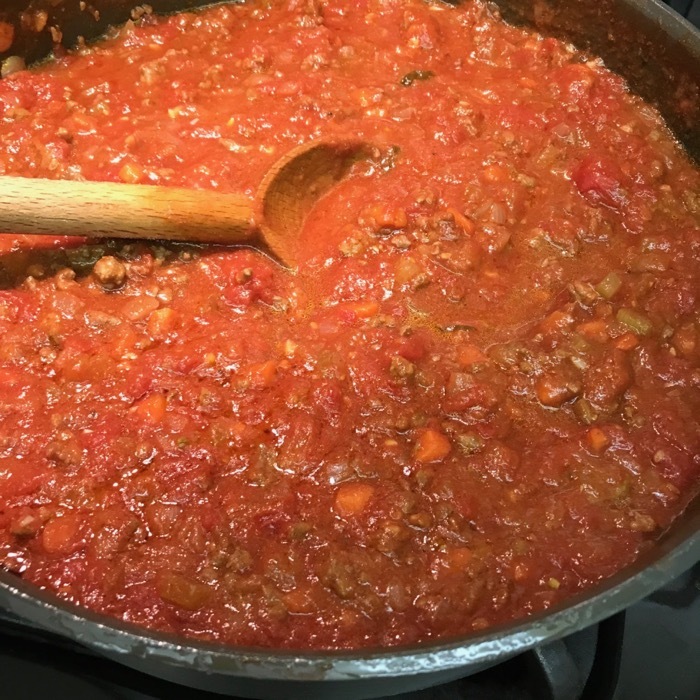 Combine the Bolognese Sauce and the Tomato Sauce and use. I find it best to make this a day ahead to let the flavors blend. I had just read about this recipe in the New York Times that morning, and at noon, out of the blue, three relatives called to say they were coming by at lunchtime…from Utah…but don’t go to any trouble. We had just returned from a trip abroad, no food was in the house, the jet-lag was flaring badly, but here was this gift of a recipe, and with a few modifications I had it ready to go in no time. Make it. It’s delicious and quick. Measure out 1 quart of water, and bring to a boil. In a separate pan, large in enough to hold the dry spaghetti laying flat (I cheated and broke off 2 inches off the ends), place the dry spaghetti, most of the tomatoes, lemon zest, oil and salt. Add the boiling water to the pan with the spaghetti. Cover the pan and bring to a boil. Remove the lid and simmer for about six minutes. Occasionally use tongs to lift and separate the spaghetti so it doesn’t stick. 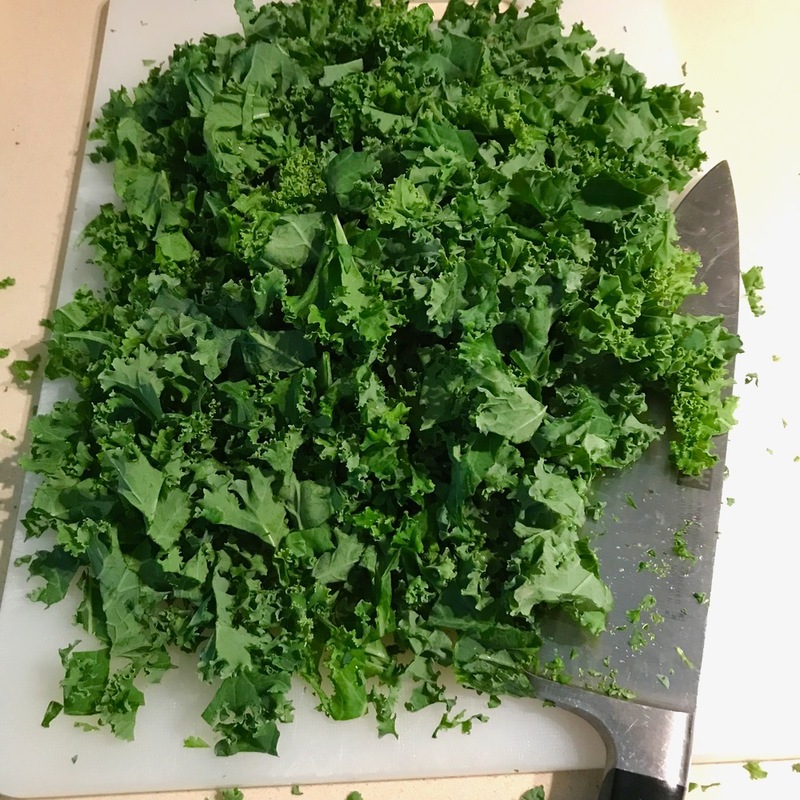 Add kale (or spinach) and continue cooking until liquid has been reduced to a sauce, the pasta is cooked through, and the kale is tender (but not overdone). Correct seasonings, top with cheese and remaining 1/2 cup sliced tomatoes. Serve. Cooks’ Notes: Some have suggested adding a pinch of hot pepper flakes to the simmering concoction for a bit of a kick. Posted in Non-Meat Dishes, Pasta/Grains, Quick! 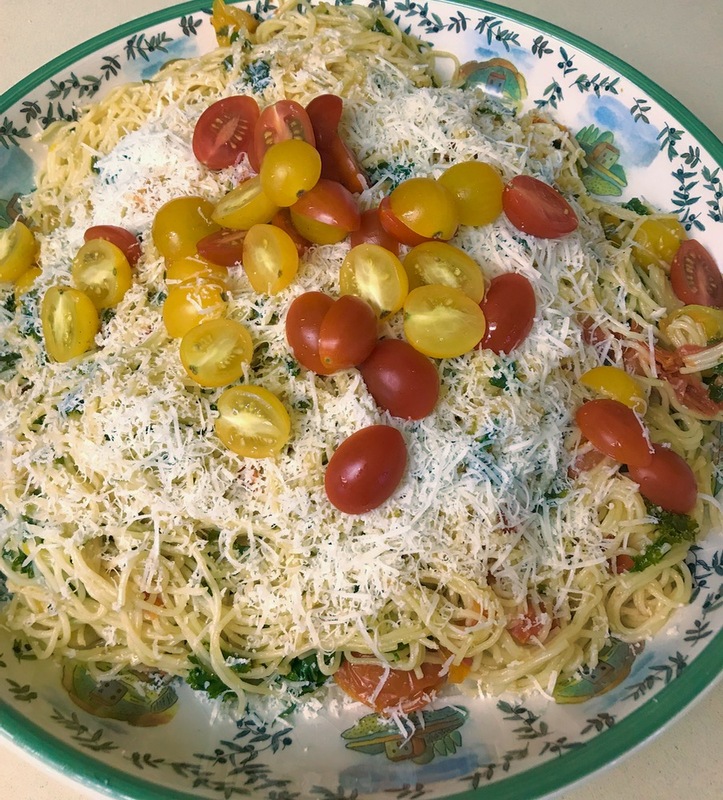 This recipe, found on the New York Times’ Recipe Site is a total winner, if you’ve got cherry tomatoes going gangbusters in the garden, which I do. Melissa Clark made hers with red tomatoes, but I always plant the little golden plum cherry tomatoes and they keep going when all the other toms in the garden have given up because of the heat. While she calls for fusilli pasta, any small shaped pasta will do. I adjusted the ratio of tomato mixture to pasta, using a little bit less pasta than she called for. Lastly, my garden’s mint wasn’t producing, so I omitted that as well, but I’m looking forward to trying it! Bring a large pot of heavily salted water to a boil. Add pasta and cook until 1 minute shy of al dente. Drain pasta, reserving 1/2 cup pasta cooking water. Meanwhile, heat a large skillet over medium-high heat for 15 seconds, then add the oil and heat until it thins out and easily coats the pan when swirled. Add pancetta and cook until it starts to render its fat, about 2 minutes. Add garlic, red pepper flakes and a large pinch of salt and pepper and cook until fragrant, about 2 minutes. 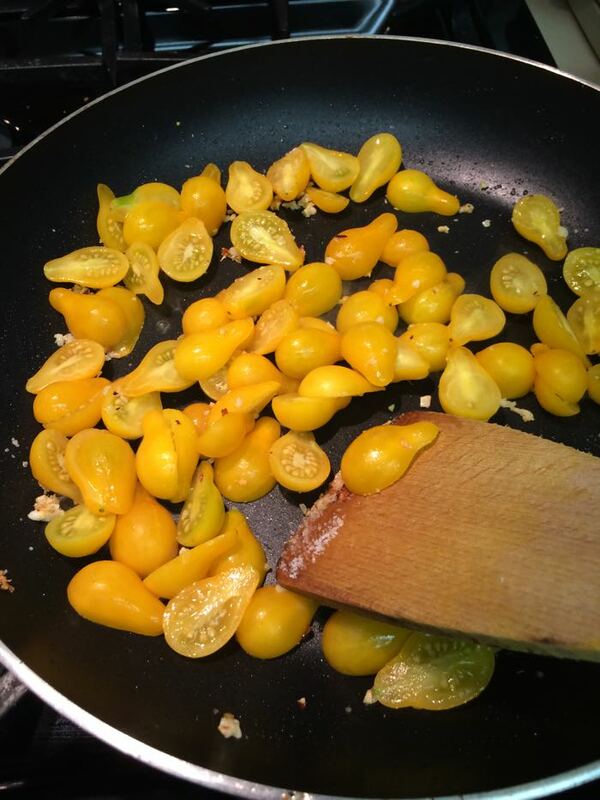 Add tomatoes and cook until they burst, turn golden at the edges and shrivel up slightly, about 5 to 8 minutes. 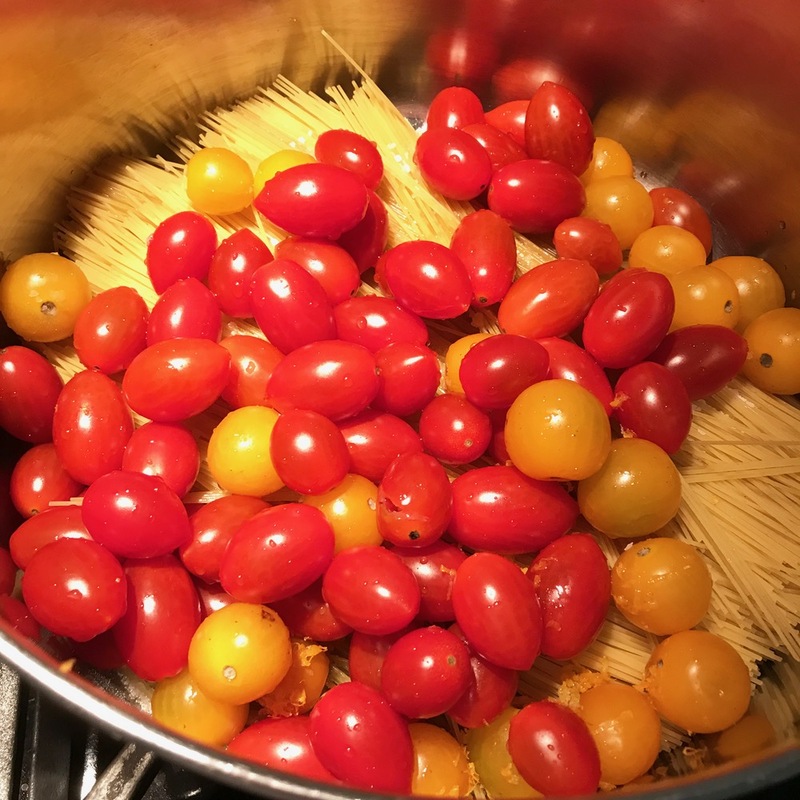 Add pasta to pan and toss with tomato-pancetta mixture; if the mixture looks dry add a little pasta cooking water a few tablespoons at a time. Cook over high heat until the pasta finishes cooking in the sauce. Add the butter and toss until it melts and coats everything. Divide pasta among warmed pasta bowls. Garnish with dollops of ricotta if desired, and top with a generous mound of fresh mint and scallions. Drizzle with olive oil and sprinkle with sea salt and more pepper before serving. Recipe adapted from Chris Jaeckle, All’onda, New York. Further adaptations from Sam Sifton, and then further adapted in my kitchen. 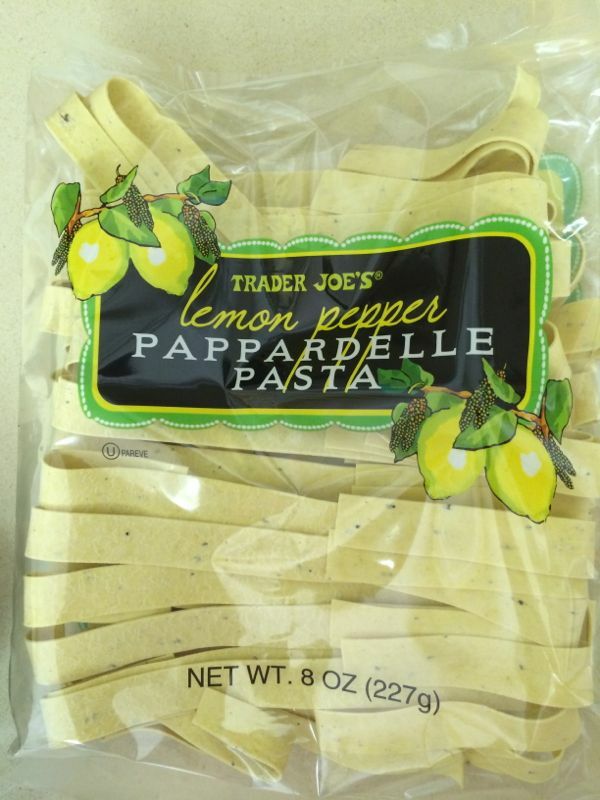 Put the water on to boil for the a Lemon Paparadelle noodles from Trader Joe’s or use any high quality flat noodle that is at least 1/2″ wide. In between all other tasks, cook the noodles to al dente and the let them drain. Just before combining with the mushrooms, run hot water over them to freshen and unstick, the let drain again. Or, just get the timing down so the noodles are ready when the mushrooms are. 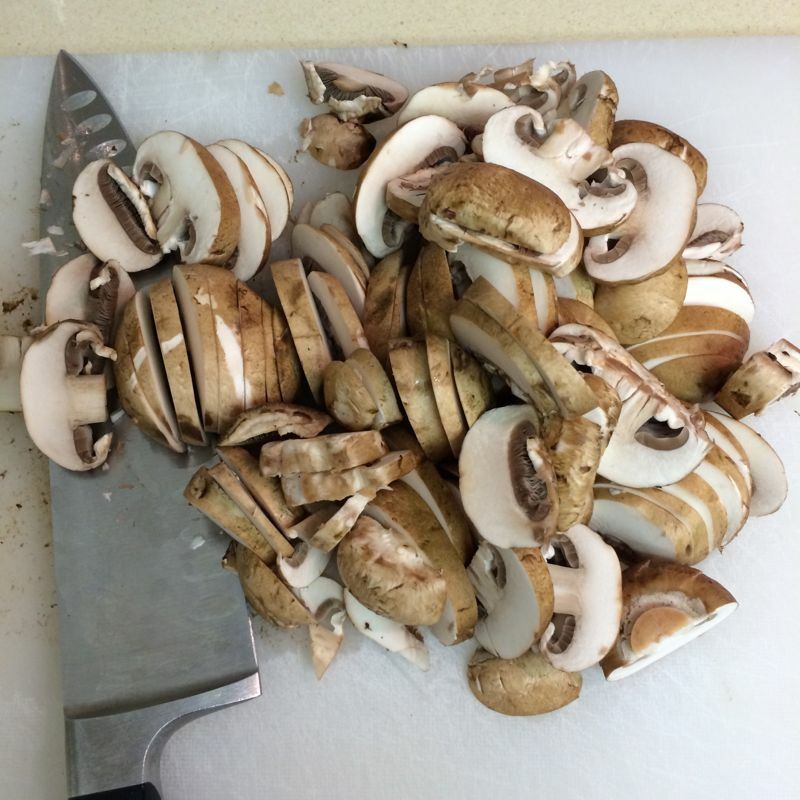 About 20-30 ounces of mushrooms, thinly sliced (It’s better with a combination of mushrooms, such as Golden Oak, Crimini and Shiitakke, but it’s still quite good with just white mushrooms and crimini.) I do not measure, but when combining the mushrooms at the end, most go into the mixture, but some might be held back for another day. You be the judge. 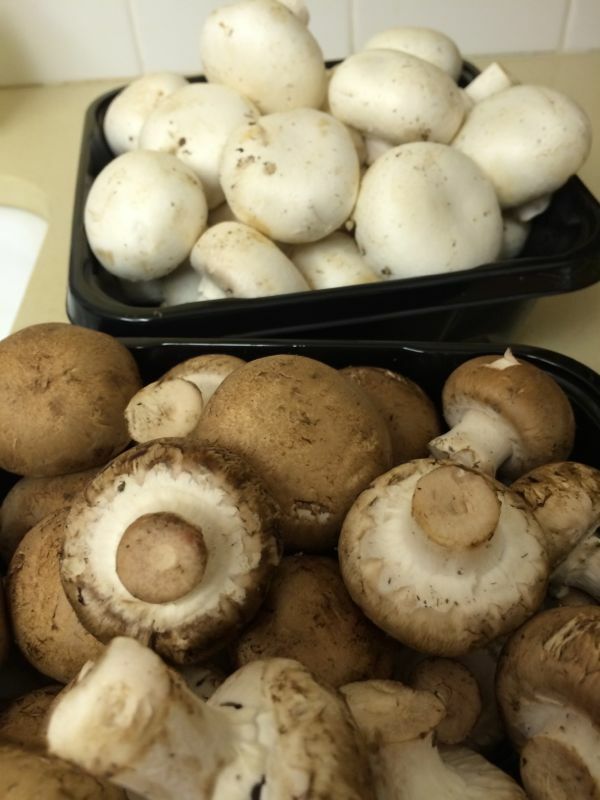 So as to not crowd the mushrooms as they cook,work in batches to cook them. For each batch, melt 2 tablespoons of the butter in a sauté pan set over high heat until it has melted. Add 1/2 pressed clove of garlic, then about 2 -3 cups of mushrooms, and sauté 3 to 4 minutes, turning until browned, tossing frequently, until mushrooms are coated with butter and start to wilt slightly. The ratio is more important than the quantity (a small amount of butter and garlic to the mushrooms), so if your pan is smaller, use fewer mushrooms. Remove to a bowl, then repeat until all mushrooms have been cooked. Remove last batch to the bowl. Add the beef broth to the pan deglaze the surface, using a wooden spoon to scrape at the browned bits. Allow the stock to reduce by half, then turn the heat to medium-low and add the remaining 3 tablespoons of butter, whisking to combine, followed by the soy sauce, cream and olive oil. Allow mixture to cook until it thickens a little, then remove from heat. Taste for seasoning, adding black pepper, if desired. Add the mushrooms to this, tossing to coat as well as incorporate any accumulated juices (can drain those out earlier into soy mixture if desired). 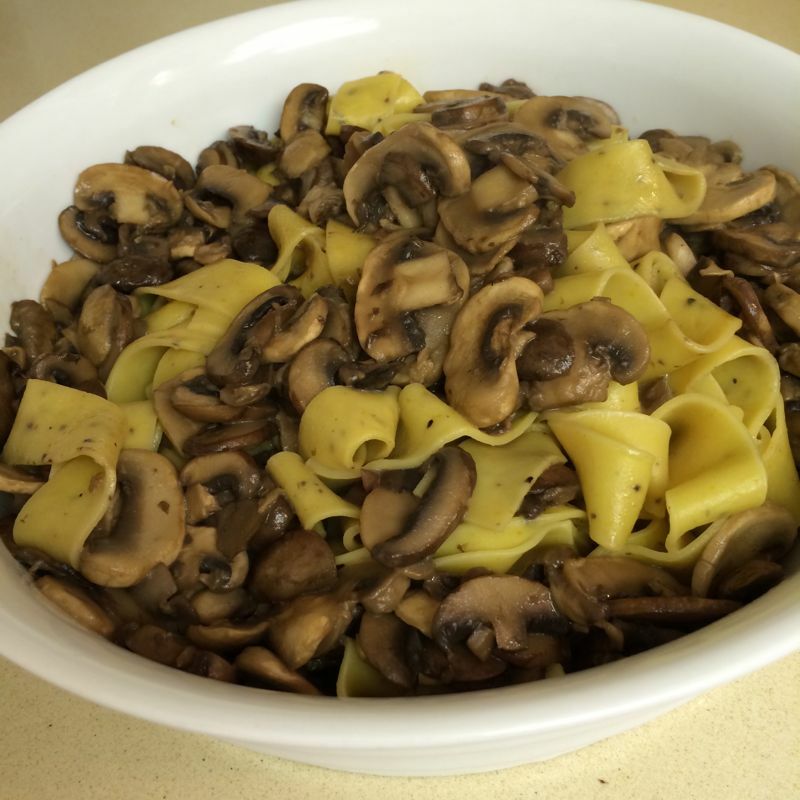 Put the warm noodles in a warmed bowl, then top with mushrooms and the sauce. Serve immediately. This recipe is from Smitten Kitchen (link to the right), but my sister Christine says she’s made it, so I know it’s been around a while. Basically you puree some peas, add the rest of the pesto ingredients and toss cooked linguine with this and some of the pasta water, and you have a quick and delicious summer meal. I mean it was so delicious I’ve had it every day this week and I’m still not tired of it. It’s creamy without being high-fat-high-calorie. I used the frozen peas, but did buy a fresh bag so we didn’t have to use that bag that’s been kicking around the back of the freezer all winter. We served it with fresh tomato bruschetta on crostini--a perfect meal. Prepare an ice bath, a large bowl filled with ice water. Bring a small saucepan of lightly salted water to a boil. Add peas and cook for 2 minutes (this leaves them with a bit of structure). Drain peas then add them to the ice bath (if using) and drain again. 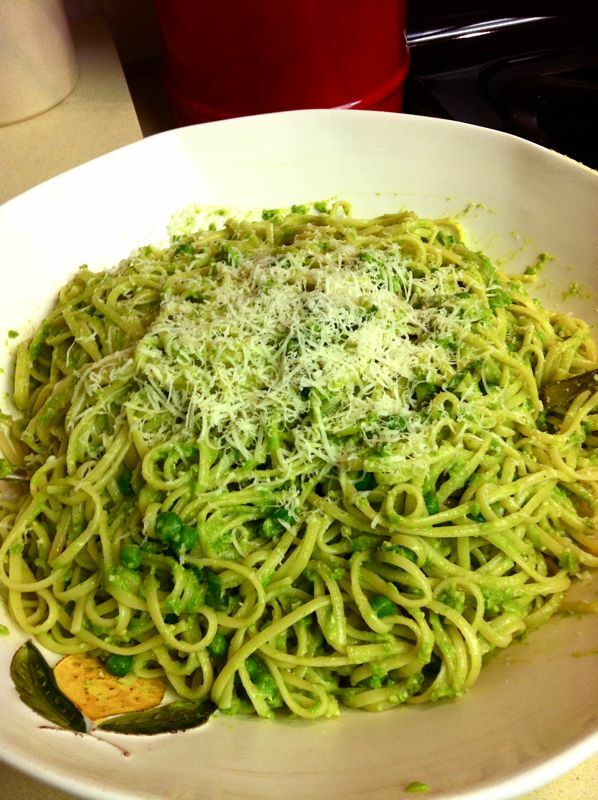 If you haven’t used an ice bath, let your peas cool to lukewarm before making the pesto. Set aside 1/2 cup of your cooked peas. Whirl the remaining cup of peas in the work bowl of a food processor with garlic, pine nuts, 1/3 cup parmesan and salt until smooth, about 2 to 3 minutes, scraping down the bowl as necessary. With the machine running, drizzle in olive oil. Cook your linguine until al dente. Reserve about two cups pasta cooking water, as the pea pesto will be surprisingly thick, then drain linguine and return it to pot. 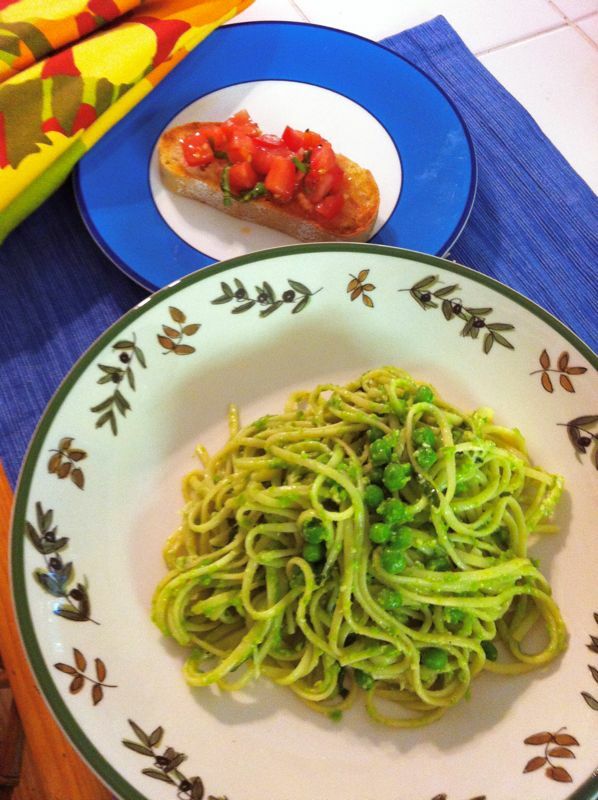 Over moderate heat, toss pasta with pesto, reserved peas and as much reserved pasta water as needed to smooth and distribute pesto; let cook for one minute so that the pesto adheres. Adjust salt to taste, add freshly ground black pepper if desired. Serve immediately, garnished with fresh herbs, if using, and remaining parmesan. It was at the end of a long three weeks of baking, prepping, shopping, comparing prices and shopping again for a women’s conference luncheon (for 300! ), when we had the occasion to have over some family who had come into town unexpectedly. What to serve? While elaborate dishes can be fun to make if you are in the right mood, I was not in the right mood for such a recipe. So my husband and I opened up our brains and creativity to pull together what we call Pasta Jumble. It’s quick, it’s easy, and it contains just about whatever you have in your refrigerator. But it all starts with a box of small, shaped pasta. My favorite is campanelle–a trumpet-shaped pasta with a fluted edge, but do try and keep in your pantry interesting shaped pastas. They go on sale quite often. This may vary depending on what vegetables and other items you have in your fridge; I’ll list what has gone into the above dish. This serves 6-8, amply. Boil pasta until nearly tender (al dente), drain well, then place into large mixing bowl. While pasta cooks, fry bacon until cooked, but not dark or too crisp; drain on paper towels. And while that cooks, melt butter and olive oil together and add onion and bell pepper; cook until tender, about 5-8 minutes. 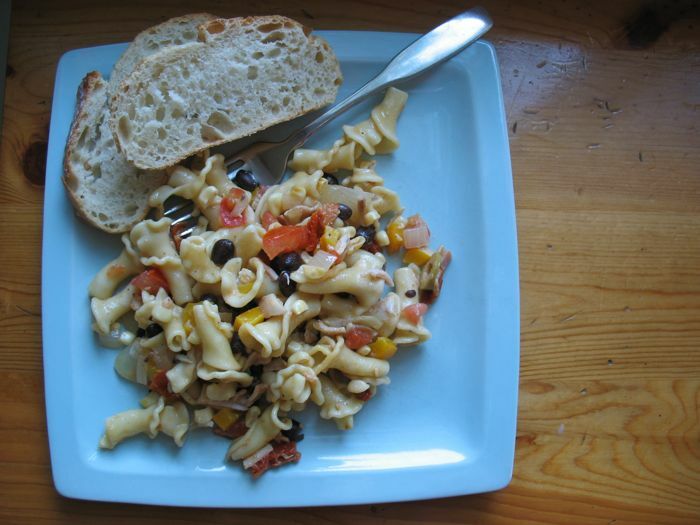 Add corn, olives, chicken, sun-dried tomatoes, black beans, cooked bacon, sauteed vegetables, fresh tomatoes to the pasta, and toss lightly to mix. A proper vinaigrette could be made here, but instead I’ll include the cheater method: glob some olive oil over the mixture (about 1/4 cup), two to three shakes of vinegar (roughly 2 Tablespoons), a squirt of mustard, salt and pepper, and stir. Add cayenne to taste (we’re wimpy–about 1/4 teaspoon for this amount). Add more salt and pepper if needed. Posted in Main Dish, Non-Meat Dishes, Pasta/Grains, Quick! Recently my sister came to visit and while I was more than happy to go out for dinner every night (my husband was gone and I like doing that), there came a time when we were both ready to stay in. What to cook? 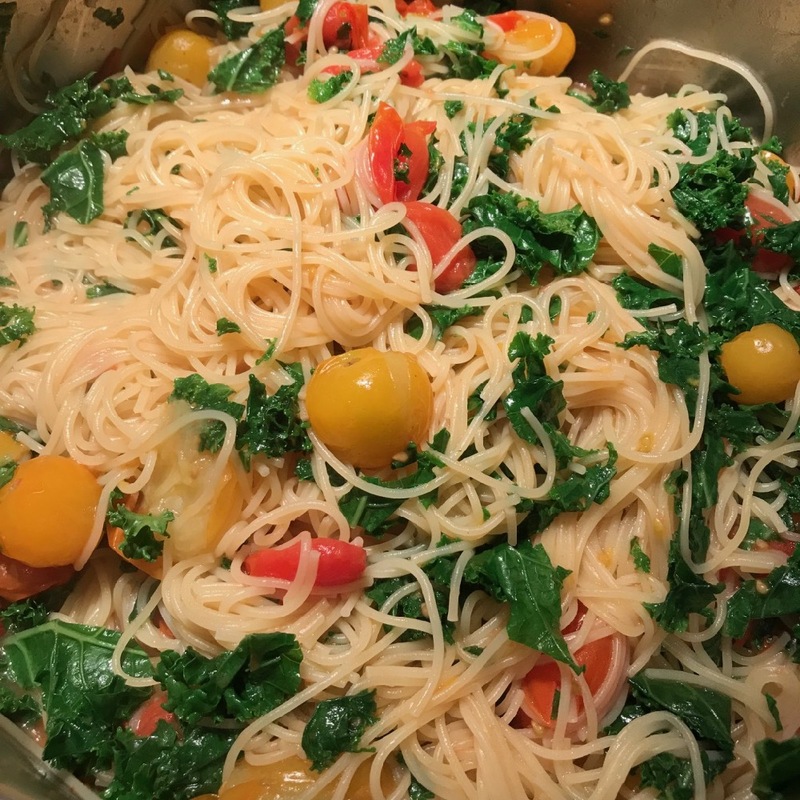 I’d just been reading Dorie Greenspan’s blog, where she gave the recipe for her Beggar’s Linguini, from her new book Around My French Table. This sounded great to both of us, and I already had most of the ingredients. Basically it’s a sauce made from browned butter, golden raisins, pistachios and chopped almonds, tossed with some Parmesan and some grated orange rind. It has a rich, yet not overly heavy, taste. I made it again the next week for Dave and we were both angling to have the leftovers for lunch the next day. 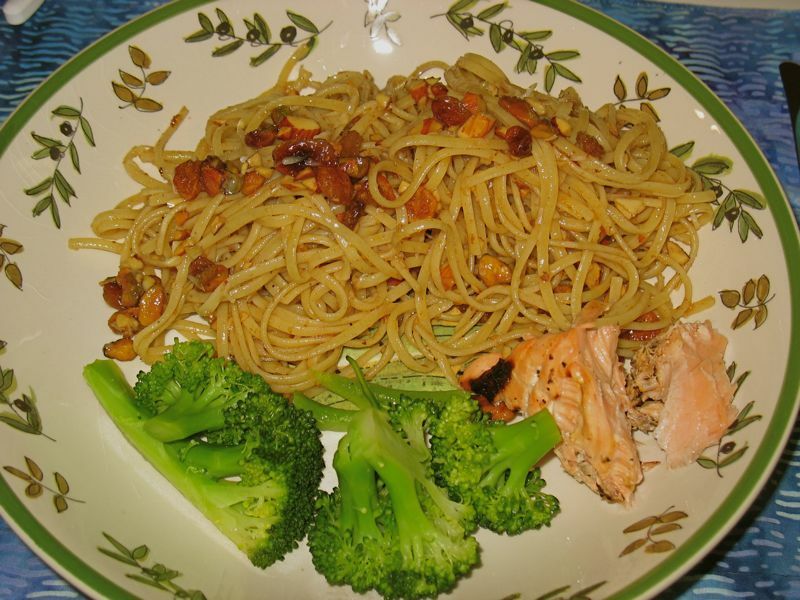 Cynthia and I served it with fresh broccoli, lightly marinated salmon, grilled on the barbeque. One last note: even though she says it doesn’t reheat well–I liked it fine the next day for lunch. Cook the linguine according to the package directions; drain well. 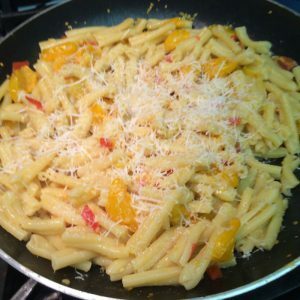 Meanwhile, about 5 minutes before the pasta is ready, melt the butter in a large high-sided skillet or casserole over medium heat, as you’ll be adding the pasta to this (so make sure it is large enough). Whe the butter is melted and golden, stir in the nuts, figs (or dried apricots) and raisins. Allow the butter to bubble and boil, as you want it to cook to a lovely light brown, or to turn into a beurre noisette, butter with the color and fragrance of hazelnuts. When the butter has reached just the color you want, add the pasta and stir it around in the butter to coat it evenly and make sure the fruits and nuts are well incorporated, then season with salt and a generous amount of ground pepper. Place in serving bowl, and add the grated cheese, tossing to blend, then dust with the orange zest, chives and/or parsley. Taste, and add more zest/cheese if you like. Serve immediately, but give it one more toss to blend in the zest and herbs. I have never made this recipe the same way twice. 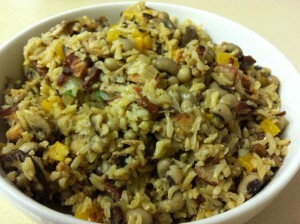 I give you Margaret’s basic Hoppin’ John recipe, then directly after that, how I made this year’s version. 1 to 1 1/2 cans black-eyes peas, undrained. Add all to crock pot. It is ready when hot, about 2-3 hours. Rice can be white, brown or wild (I use brown rice). This is mild, add dashes of Tobasco until spicy enough or use spicy sausaage. I serve with blue corn chips or Fritos or hefty corn chips. This year I sauteed up a yellow bell pepper with the onion, and used fresh black-eyed peas, found in the produce section of my grocery store. Instead of the sage sausage, I used some cooked chicken-apple sausage that we had left over from our holiday party. 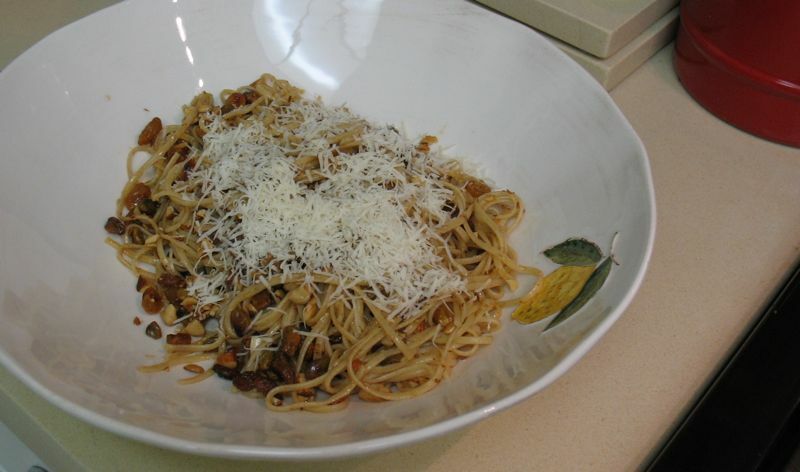 I also sauteed crimini and shiitake mushrooms, and added them to the mix. I gave it four-to-five shakes of Tobasco, added some salt and pepper and wrapped it up and put it in the fridge to mellow the flavors, while I started to take down Christmas. I wasn’t happy with the flavor, though–too bland. Then I remembered Bayou Blast–a comglomeration of spices that I use when I make dishes for Mardi Gras (scroll down the the bottom of the linked page for the recipe). I added in 3/4 teaspoon of those spices–a little a time, stirring well after each–and that did the trick. Serve it with your choice of bubbly (mine’s Martinelli’s) and an Everything Green Salad. 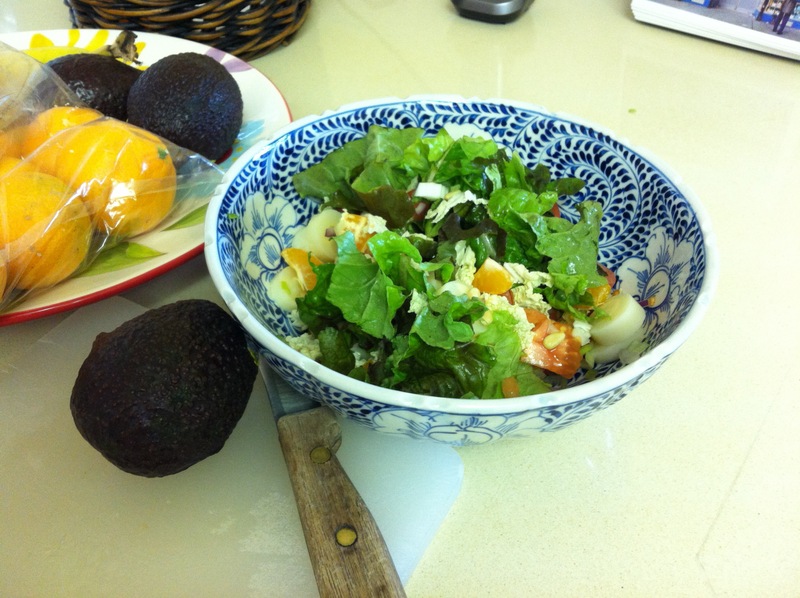 This one has chopped leafy green lettuce, chopped napa cabbage, mandarin oranges from my friend’s tree, pine nuts, chopped tomato, palm hearts and (soon) avocado. A light dressing of oil, vinegar, salt and pepper will complement the ingredients. I first read this recipe in the New York Times, in a special article on summer salads with recipes by Martha Rose Shulman. I subjected Dave, my husband, to a series of these, and he declared this one to be a winner. 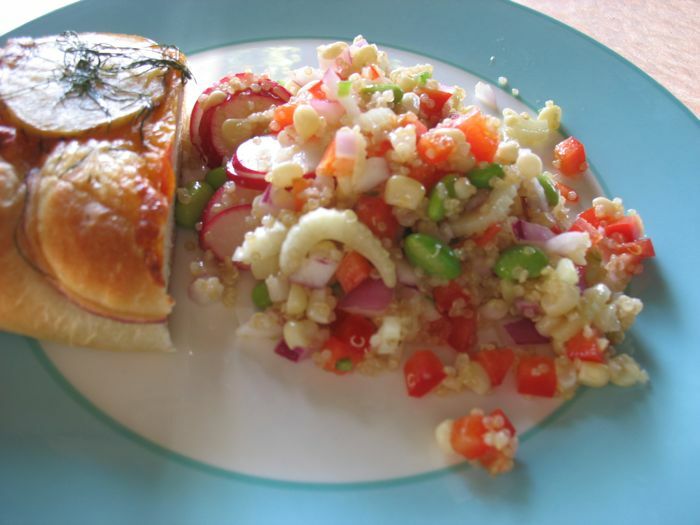 It’s pretty–green and red–and crunchy, but not a wildly out of control crunch–just pleasant fresh vegetable munching. While this is a summer salad, I could also see it served as cold side dish at a holiday buffet, as the colors are so beautiful. Regarding the “optional” feta cheese: we tried it both ways–with and without. Adding the feta cheese brings a creaminess, a certain “mouth” satisfaction to the dish. I recommend it. 2 ounces mild feta, cut in small dice (about 1/2 cup), or crumbled. I buy the bricks, then crumble it. Soak the onion in cold water to cover for five minutes. Drain, rinse and drain on paper towels. **I have no idea why this step is here, but I did it. Must be some kitchen chemistry. Combine all the salad ingredients in a large bowl. 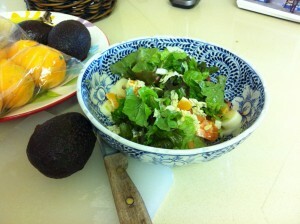 Whisk together the dressing ingredients and toss with the salad. Serve. Yield: Serves four main dish, and six side dish servings. Here’s our version. I served it with a delicious foccacia from the local bakery, which was topped with tomatoes, potatoes and dill. We were full after our meal, and our leftovers the next day were even better. First off, this is taken from the Los Angeles Times, from an article written about the Immaculate Heart Center and their new cookbook. That’s just to keep the copyright gods squared away. I think I’d like to buy this cookbook as this recipe was such an intriguing and interesting standout, that I can’t wait to try some of their others. I’ve cooked so much with the Lemon Vinaigrette recipe on this site, that the shift of the acidic flavor in this one to an apple cider vinegar was very refreshing and I quite liked it. 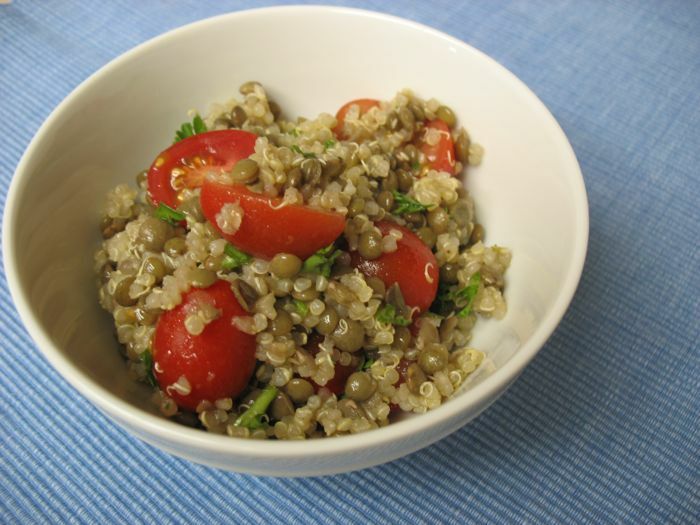 Where to buy Lentils de Puy, the small French lentils called for? Amazingly, my Ralph’s supermarket has been carrying them in the specialty food section. They cook up quickly and keep their shape. I’ve become a fan. If you want to store this for another day, I’d not add the tomatoes until you serve it. Place the lentils in a large saucepan and fill with water to cover by 2 inches. Simmer until tender, about 20 minutes, then drain the lentils and transfer them to a medium bowl. Season the lentils with one-fourth teaspoon salt and several grinds of pepper and drizzle over about 1 tablespoon of vinegar. Taste the lentils, and adjust the seasoning or vinegar, or both, if desired. Set aside the lentils to cool, stirring occasionally. In a large saucepan, combine the rinsed quinoa with 2 cups water and bring to a boil over high heat. Cover the pot and reduce heat to a gentle simmer, cooking until the grain is soft and translucent, about 15 to 20 minutes. The water should be absorbed; if not entirely absorbed, drain any excess. Remove from heat and fluff the quinoa with a fork. 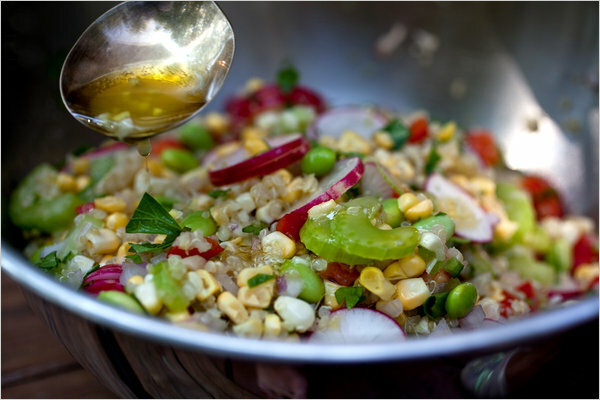 Transfer the quinoa to a large bowl, drizzle about 2 tablespoons of oil on the grain and stir gently. In a small bowl, whisk together the garlic, one-fourth cup vinegar, one-half cup olive oil, one-fourth teaspoon salt and one-eighth teaspoon pepper. Taste and add additional seasoning if desired. Stir the cooled lentils in with the quinoa in the large bowl. Stir in the dressing, then cover and chill the salad for at least 1 hour. Just before serving, stir in the mint, parsley and tomatoes and check the seasoning. Drizzle with a bit more vinegar and oil. Each serving: 387 calories; 13 grams protein; 40 grams carbohydrates; 10 grams fiber; 20 grams fat; 3 grams saturated fat; 0 cholesterol; 3 grams sugar; 202 mg. sodium. 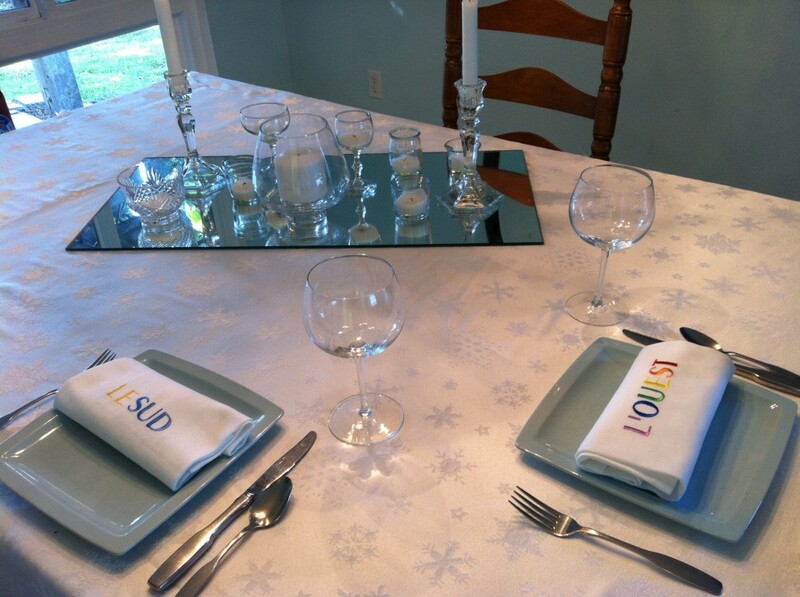 “A Place at the Table” is available for $35 plus shipping at http://www.immaculateheartcenter.org.